"I got something like this at a restaurant and it was wonderful." 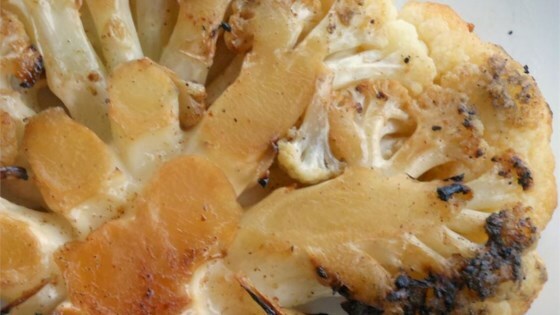 Sprinkle cauliflower slices on both sides with olive oil, brown sugar, and seasoned salt. Cook cauliflower on the grill until char marks appear, 2 to 3 minutes per side. Transfer to a grill-safe pan with a lid, cover, and continue cooking on grill until tender, about 20 minutes. My family didn't like the seasoning on this at all. The cooking method is a success, and one that will definitely be repeated with different flavors. I don't know if it is the light grilled flavor or the brown sugar that transforms the Cauliflower flavor into a little slice of heaven. Loved it! And my kids do too! This was a hit. I used my cast iron skillet on the grill to finish it. Also cut the slices from the center and cut them in half for easy handling. Husband ooood over it.